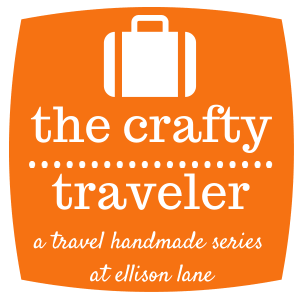 Welcome to my day on The Crafty Traveler Blog Hop on Ellison Lane Quilts! 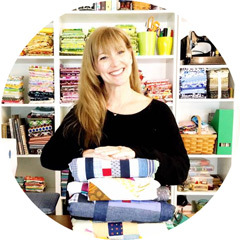 Many thanks to Jennifer and all the other talented bloggers taking the time to review patterns so you know what you are getting into before buying the pattern! Don't forget to go check out all the other great reviews and remember the dates for the link up for your chance to win some great prizes! I have said it before and I will say it again... I am not a bag sewer. I tend to say bad words ( mostly under under my breath) and maybe cry a bit when I make bags. This is not the case when I make bags by Sara from Sew Sweetness. This is not only because I may have her number on the kind of speed dial that has the ability to create a sonic BOOM but because she does take the time to think about each step of the pattern and puts it in words even a non pattern reader like me can understand. And she adds lots of photos...she knows I NEED photos,LOL! Sara also makes sure that if you do have any questions you are free to shoot her an email and she will get back to you ( she does not sleep...EVER). When she first wrote the pattern it was for me. You can read Sara's post about her version of what happened but truth be told, I told her not to do it...but I am so grateful she did! This bag is my everyday bag and has been since last October. I carry it everywhere and load it up with 1,000,000,000 lbs of crap! 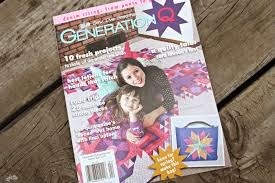 The pattern for The Katydid Bag can be found in the March/April issue of Generation Q Magazine that can be found at your local quilt shop and there have been some sightings at Barnes and Noble. I decided to do something different with this review of the bag. It has been shown as my original version and Sara's pattern with the paper pieced block. This version is for someone that does not want to or does not care for paper piecing. I decided on just two fabrics, Robert Kaufman sushi print fabric from the Chopsticks Please! ( GOOD GOLLY I LOVE this fabric) collection and Fabric Traditions dots. The handles are from Joann Fabrics and two inches longer than the ones both Sara and I used in the previous bags. Those were just a tad short for me. This bag goes together quickly when you have all the pieces cut out and all the other prep work completed. Sara offers little tips as you are going through the pattern. Please follows her tips, they are important and they will save you time and make your bag look better. The most difficult thing for me is working the thick layers through the machine. I had forgotten to put on my walking foot but once I did, things went so much more quickly! I cannot recommend a walking foot for your machine enough! To make my simple bag a little snazzier, I decided to play with the decorative stitches on my Bernina 440qe. I found that stitch 120 was a retro FUN stitch! Why use boring old topstitching when you can do THIS! You can even use this stitch on the zipper! I used Aurifil 50wt in a lovely gray but in hindsight I really wished I would have had the courage to just use RED or YELLOW! Next time I will be BOLD and DARING! The way the recessed zipper goes in will make you love this bag even more. it is so simple and straightforward. I recommend a thicker zipper, I think I used a coat or jacket zipper. I found on my other bag that the smaller zipper was a little difficult to ease of use. It was no more difficult to put in than a regular zipper. Check out more of the reviews on these great blogs!!!! 3/3: Old Red Barn Co. I love your bag! It looks amazing. I've heard such good things about her bags-I want to try one! I'm thinking Katy's done being in the snow ;o) Love that fabric and the fancy top stitching along the zipper edges! Love the way it turned out! Her patterns are amazing. So cute, even in the snow! Thank you SO much for being part of the hop Kim. Big hugs.